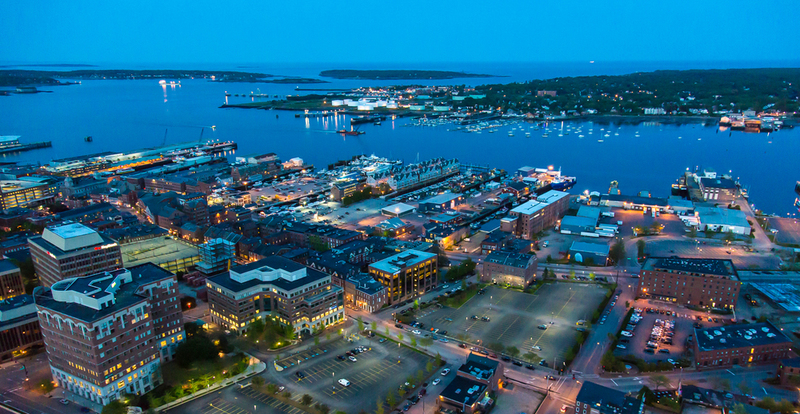 Maine Imaging specializes in aerial photography, gyro-stabilized aerial video, UAV drone photography and video, custom photography, and stock aerial images of Maine and New England. Maine Imaging specializes in aerial photography, gyro stabilized aerial video, custom photography, and UAV (drone) operation. 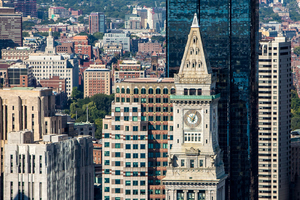 With over 15,000 recent stock aerial images of New England, including ME, MA, NH, RI and CT, and hundreds of stabilized aerial video clips, Maine imaging has the most comprehensive collection of New England aerials available today. These images are available as prints, in almost any size and medium, and commercial digital downloads. The video clips are available in low res internet size, or full high resolution files for video production. Take advantage of our search bar and enter your town or a keyword to search out galleries for just the right shot. Just because most of our work is done in the air, doesn't mean that we don't know how to use our cameras on the ground. We can shoot video on the air and ground, and provide you with raw video for your project, or take that video and produce a complete video informational piece, including music, motion graphics, and packaging. And, at a fraction of the cost of a production company! Would you like to add some time lapse video to your project? We have seven cameras that can capture time lapse sequences from different locations, so we won't miss a thing. With clients stretching from Northern Maine to Connecticut, Maine Imaging is a full service custom aerial photography company. We offer very competitive rates, discounts for multiple target photo/video missions, and turn around time that puts your color corrected images or video in your hands, often within 24 hours of the photo flight. We use high winged Cessna 172's, as well as Robinson helicopters for our aerial platforms, combined with professional grade Canon cameras, L series lenses, and a two axis gyro stabilizer, for tack sharp images. A night time aerial image of Palace Playland and old orchard beach, Maine. Shot from a helicopter, using a two axis gyro stabilizer, at 1/80th of a second. Maine Imaging is a Maine based photography company, specializing in aerial photography and videography in Maine and New England. We currently have over 15,000 stock aerial images of Maine and New England, and several hundred stock aerial video clips. Our services include stock aerial photos and videos, custom aerial photography and gyro stabilized aerial video, freelance photography and videography, and video production services, including motion graphics and music. Our equipment includes Canon professional DSLR's, including the new 5DsR (50mp), 5DMIII, Canon "L Series" lenses, GoPro cameras, and DJI Phantom 4 Professional drones. We have been using the new Canon 5DsR to shoot our "Mega Panoramas". With image file sizes approaching 200MB, you can print images to 10 feet or more and still have incredible resolution! Our software includes the latest editions of Adobe Photoshop, Premier Pro, After Effects, and others. We are dedicated to producing the highest quality product for our clients, with a fast turn around time, and extremely competitive pricing. 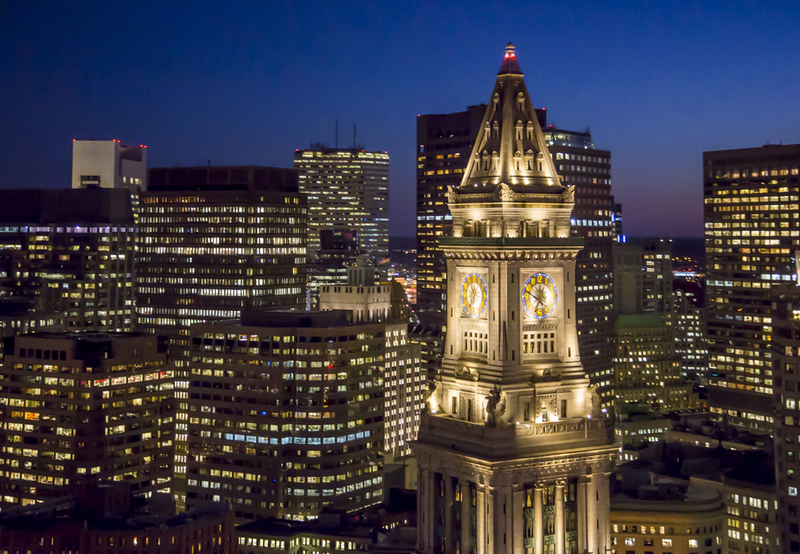 The Custom House Tower at night, shot from a helicopter with a Canon 5DMIII, mounted to a two axis gyro stabilizer. 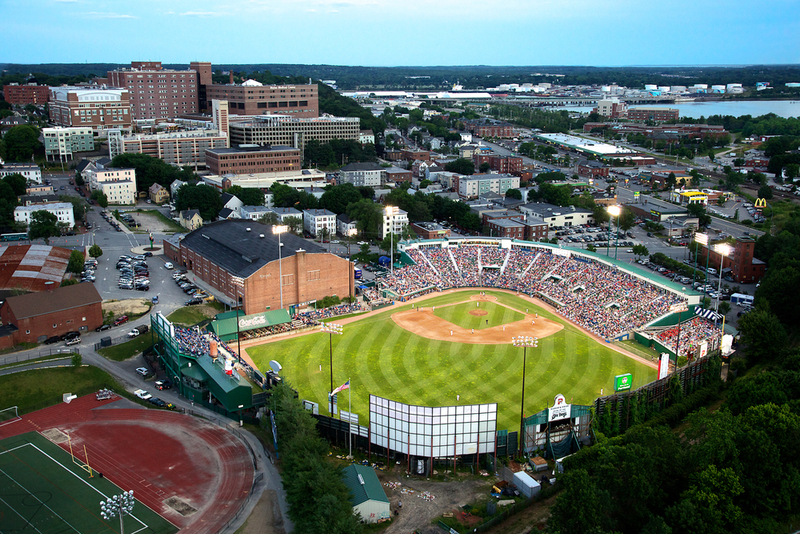 A twilight shot of Hadlock Field, home of the Portland Seadogs, the AA affiliate of the Boston Red Sox. Shot from a helicopter, using a two axis, Kenyon Labs gyro stabilizer. Summer of 2012. Maine Imaging can shoot custom aerial stills from a plane or a helicopter. Helicopters are more money, but if you're looking to get "up close and personal" with a project or structure, or if you're looking for that very "dramatic" shot, helicopters are the way to go. They are also a must if you need video to accompany your stills. If you don't need to be that close, a high winged plane, usually a Cessna 172, will do the trick. And with Canon's L series lenses and the 50MP 5DsR, you'll be able to count the shingles on your house! We also offer drone services for both photography and video. Our newest drone produces a 20mp image file, with less distortion in the images than the cheaper drones produce. A near vertical shot of an I-95 cloverleaf in Providence RI. Part of a project to document the "renovation" of downtown Providence. Shot from a Cessna 172, during an extremely hard bank. Fall of 2012. Prices start at $400, and include plane, pilot, photographer, and post processing. Mulitple properties on the same flight will be discounted. Additional travel costs may apply. Contact us with your property locations for pricing. Our goal is to produce large, tack sharp, image files during the flight. Once back in the office, all images will be sharpened, color corrected, and have the horizons leveled. Then, the high resolution image files will be digitally transmitted to you, usually within 24 hours of the flight. A standard property usually yields 10-20 high resolution image files. The combination of a two axis gyro stabilizer and the low light capability of the Canon 5DMIII, make shooting excellent quality high resolution images and video at night possible. Portland, Maine. Summer of 2013. Sailboats wait at the dock at Community Boating, on the Charles River in Boston. Shot from a helicopter. Summer 2013. Maine Imaging uses helicopters, a custom designed, dual axis, Kenyon Labs, Gyro Stablizer as a mount for a Canon 5DsR or 5DMIII camera. This combination produces smooth video, both during the day, and at night. It also allows us to shoot at 60fps, should you need slow motion. Need stills to accompany your video? No problem. The new Canon 5DsR puts out a 50mp image file, which is large enough to print a 4 foot poster, while still retaining incredible detail. If you are looking for video clips of your area, town, facility, boat, or golf course, we can do it. We can deliver your video in several formats, including H.264 and .MOV files, both edited and raw, and most often within 24 hours of the flight. Contact us today with an idea of what you are looking for, and we'll get right back to you with a quote. The S/Y Marie, under sail during the Shipyard Cup in Boothbay Harbor, Maine. Summer of 2013. Have several properties or locations that you need aerials of? Need both aerial stills and video? Have projects all over New England? Or beyond? Let us know what the parameters of the job are and we'll work out a quote to fit your needs. We currently have over 15,000 stock aerial photos of Maine, New Hampshire, Massachusetts, Rhode Island, and Connecticut. All of our aerial images were taken within the last five years, using digital cameras, and are color corrected, sharpened, and have their horizons leveled. All are in JPEG format, so if you want to tweak the image after you have it, you'll be able to. Our galleries are laid out by state and town. There is also a search bar. Just type your town into the search bar, and it will bring you right to the images. Click on the "Add to Cart" button to check out pricing, print sizes, and types of paper. You can even order framed prints and merchandise! Lobster boat, fishing off of Portland, Maine. Time Lapse video is, essentially, a series of images, taken with a set time between each image, and then stacked together and rendered as a video. A time lapse video may be from one camera in one location, or from several cameras in several different locations. It can be a simple as a single sequence, part of a larger video, or a full production with multiple cameras, music, and graphics. If you think you have a project that would benefit from time lapse video, contact us with the project parameters, and we'll put together a quote. This is a three+ hour time lapse video of the composite deckhouse being lifted onto a brand new Zumwalt destroyer at Bath Iron Works in Bath, Maine. Maine Imaging also does work from the ground! We have the equipment to shoot your next video. Cameras, sound equipment, sliders, mini-cranes, and GoPro cameras we can stick about anywhere. This year, we even stuck one on the working end of a excavator running a metal sheer, and got some incredible footage of I-beams from a bridge being chewed up! We aren't a big production company with lots of overhead. We are a small company, with some knowledge behind us, willing to push the envelope a little for some exciting video. We can shoot raw video, if you will be editing and producing your own video. Or, we can shoot and produce the video for you. Have a video project in mind? Let's get together to discuss it and work on a game plan. An aerial shot of a tour boat from Boothbay Harbor, Maine. Digital downloads are also available through the "Add to Cart" button. Scroll to the digital downloads section, where you'll find 4 available digital download image file sizes, ranging from a small internet size to the huge "Original" file size. Most of the newer "original" file sizes are larger than 20MB, plenty big enough to print a tack sharp poster. Need larger files? Contact us with a description of how large an image file you need, and we will create that file for you at no charge! When the aerial season winds down, we don't just go into hibernation till next year. We travel the state looking for wildlife, Maine scenics, landscapes, seascapes, and long exposures. Visit our "Scenic" gallery to view these and more. Dave is a military plane buff, so if you are into old and new warbirds, check out his "Vintage Planes" and "Modern Planes" galleries. Want to see what a 16 minute exposure looks like? Visit the "Long Exposure" gallery. Looking for something specific? Use the search bar! A WWII Corsair, light painted against the Milky Way. 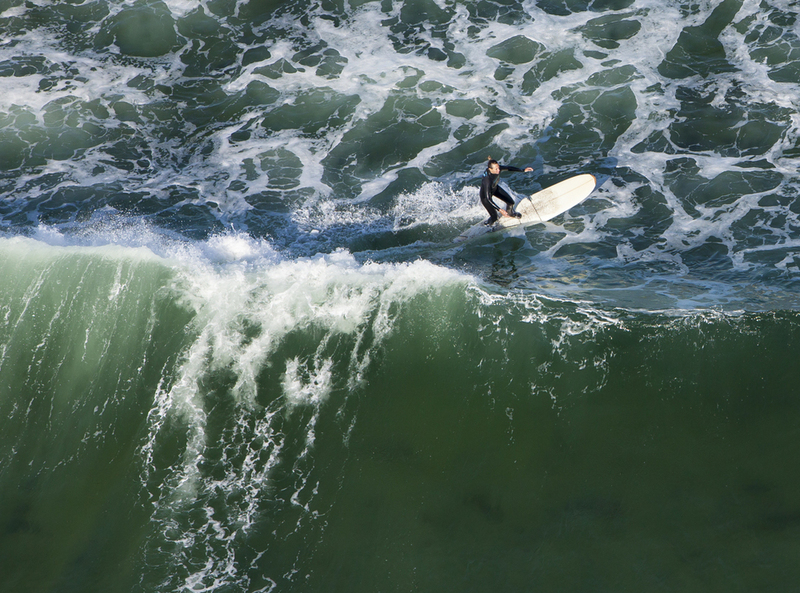 An aerial shot of a surfer, near Kennebunk, Maine. Maine Imaging routinely accepts freelance photography jobs around the state of Maine. With a knowledge of small flash lighting and larger video set ups, we have successfully worked on several recent projects, including an advertising campaign for Amtrak (NNEPRA), a couple of photo essays for Downeast Magazine, and a series of video interviews, documenting our World War II veterans. Part of the work for Amtrak involved shooting models using multiple flashes and reflectors, inside of a moving train, all the while using slow shutter speeds to blur the motion happening outside of the train. Challenging? Yes. Was the client happy with our work? Definitely! A very challenging shoot involving multiple flashes and reflectors to evenly light models inside of a moving Downeaster train. Shot for an Amtrak (NNERPA) advertising campaign, this was shot from a helicopter, 100' above the Downeaster Train, moving at 80 knots. I was using a gyro stabilizer and a ND filter, in order to slow the shutter speed to 1/40th/second to blur everything but the train.